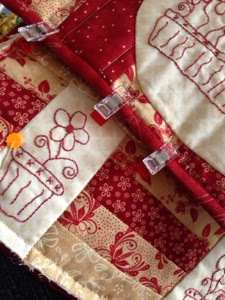 Quilting is my Down Time: Four more sleeps. Happy news. Four more sleeps. Happy news. Until I travel to Bathurst for the weekend. I get to meet bloggers and spend the weekend doing what we all love sewing, eating, shopping etc. I am new to this group and will be looking forward to catching up with Kerrie and Dorothy and then meeting all of the other ladies. I am undecided as to what I am taking but I think some UFOs both machine and hand work. I passed the unit I was studying. Much better results then thought. Now only three units to go and the degree is complete. Since finishing I have been able to work on my sewing. For a while now I have been working on an arm chair caddy which was part of the package from Indulge in Stitcjes held in the Barossa Valley hosted by A Country Hart. I am up to binding it all together. This week I will be putting the finishing touches on my items for the Santa Sack Swap. Will post some finished items during the week. A big congratulations to you Simone on passing your studies, it must be a big relief for you to have it all over for now. Beautiful sewing projects. Congratulations on passing your unit, Simone. Enjoy your time in Bathurst. Congratulations on your results, Simone. Enjoy Bathurst - sorry I'm missing out this year - please say hi to everyone for me, especially Chooky. Good work, some stitching is a great reward. Sorry I won't meet you in Bathurst, maybe next time. Have fun. Congratulations! Ckever gal. Have fun meeting up at Bathurst. Give Kerrie a hug for me please. It will be great to meet you Simone. Enjoy Bathhurst, have fun.... congratulations on your passes so exciting for you to be near the end..